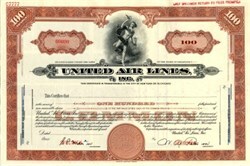 Beautifully engraved Specimen certificate from the United Air Lines. 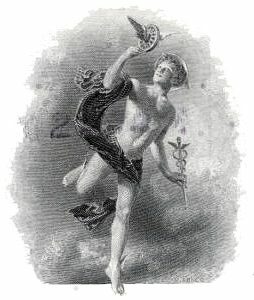 This historic document was printed by American Bank Note Company and has an ornate border around it with a vignette of Mercury holding a wheel with wings. United is an industry innovator with customer-service breakthroughs such as Economy PlusSM seating, the United First SuiteSM, Our United CommitmentSM, E-TicketSM service, airport gate readers, The ChariotSM mobile airport podium, United Shuttle, and the introduction of the technologically advanced Boeing 777. United�s Mileage Plus� program, with almost 40 million enrolled members, has been named the best frequent flyer program by Business Traveler International magazine in 1996, 1997, 1998 and 1999.